Here's another installment of my painting process of the MOLD! movie poster for the film that my buddy created. 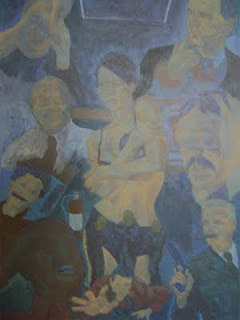 Look to my post earlier in this month to see the initial production of this painting. This is the stage I start laying down all the shadows. I like to work from dark to light, so everything should look muddy and gray at this stage. 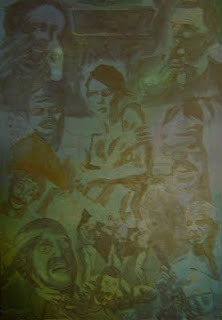 At this stage, I start to lay down the base colors of the various subjects across the painting. I'm finally getting to the fun part of painting, where I do the rendering and modeling, building up the form of the subjects. In this case, I started on the three masked military dudes because they're the smallest subjects of the overall painting.